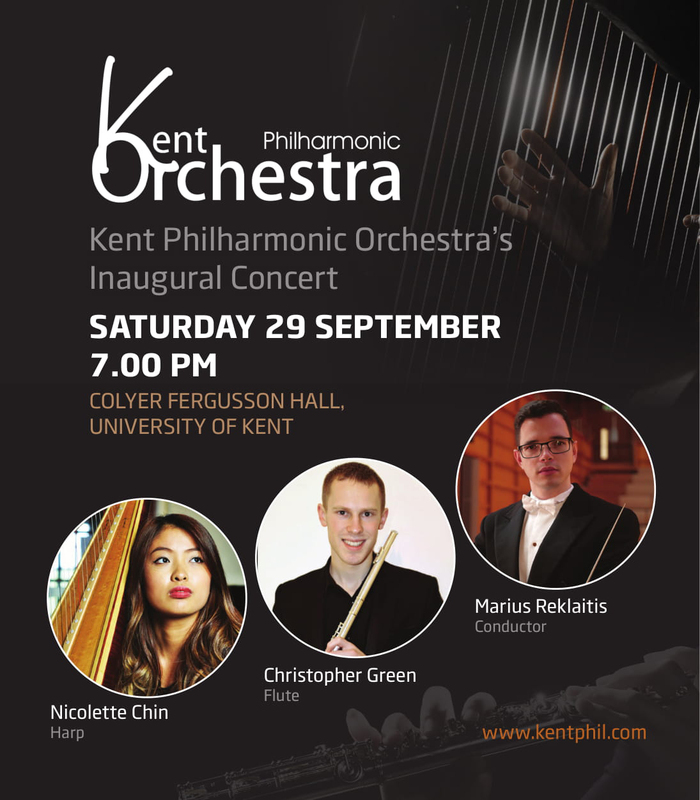 The county’s newest orchestra, the Kent Philharmonic Orchestra, is holding its first-ever concert of magical classical music at its debut performance on Saturday 29th September at the Colyer Fergusson Hall, University of Kent. Director of the Kent Philharmonic Orchestra is Lithuanian-born conductor Marius Reklaitis, who graduated from Canterbury Christ Church University with an Honours in Music before pursuing Conducting Studies at Masters level. Marius will be joined on stage at the Colyer Fergusson Hall, the city’s purpose-built centre for music performance, by a talented trio of musicians – Leader of BBC Symphony Orchestra Stephen Bryant (Leader), Christopher Green (Flute) and Nicolette Chin (Harp). Offering experiences including performances and collaborations with internationally-renowned soloists and guest orchestras from all over the world, Kent Philharmonic Orchestra promises an extensive range of opportunities for local young musicians right here in the heart of county. In fact both Christopher Green and Nicolette Chin are fine examples of young musicians whose dedication and determination have helped them achieve international and UK-wide recognition. Tickets are already selling fast for the Kent Philharmonic Orchestra’s launch concert at the Colyer Fergusson Hall at 7pm on 29th September. To book tickets, visit www.thegulbenkian.co.uk/event/kent-philharmonic-orchestras-inaugural-concert or call the box office on 01227 769075. For more information on the county’s newest orchestra, and to learn more about Marius, Stephen, Christopher and Nicolette, visit https://kentphil.com, email info@kentphil.com or call 07453 321993.